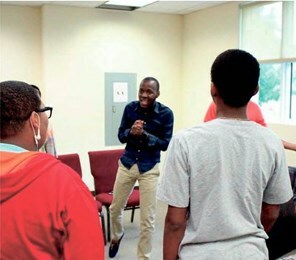 Change Makers Academy, a community-driven youth empowerment platform that uses social issues as its catalyst, hosted its first “G’s to Gents” initiative on June 4, which included a message from Miramar Mayor Wayne M. Messam. The sessions will continue every Saturday during the month of June. Program creators, Robert Stephens and Dwayne A. Stewart, designed the program to immerse 50 “at-risk” middle and high school males throughout South Florida into a dynamic culture shifting dialogue and environment and help them shift from thinking of themselves as “gangsters” to perceiving themselves as gentlemen with limitless possibilities. Eligible students from Miami-Dade, Broward and Palm Beach Counties, are invited to participate. On June 11, State Representative Shervin D. Jones will present “Creating New Stereotypes,” at 10:30 a.m; and Brandon McCord, from the Broward Sheriff’s Office will present “The Present Narrative” at 1 p.m. On June 18, Trayvon Martin’s father, Tracy Martin will address the group at 10:30 a.m. The program concludes on June 25 at 1 p.m. with a commencement ceremony. All sessions are scheduled to occur at 7951 Riviera Boulevard, Suite 104, in Miramar. Registration and tuition for G’s to Gents is $40, which includes admission, meals (breakfast and lunch on each meeting day), transportation to and from off-site events, professional headshots taken by Adrian Freeman Photography, and all program materials. To learn more about program registration, visit www.mrem- power.com, email changemakersacademy@gmail.com, or call (786) 309-7231.